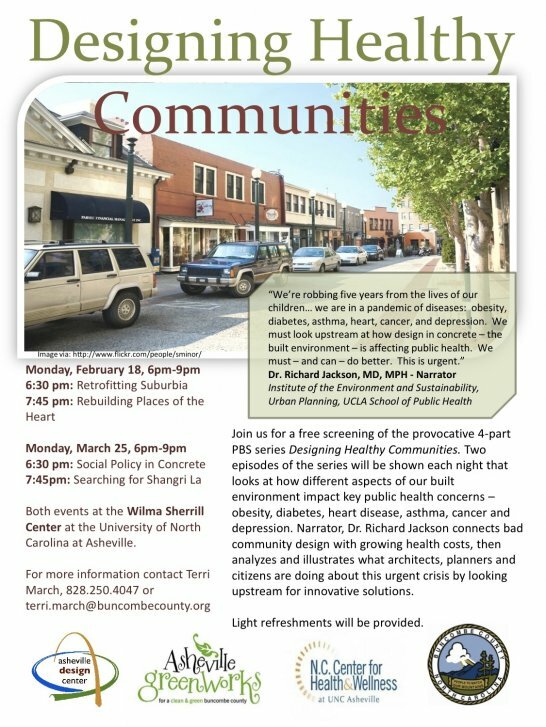 Don't miss out on tomorrow's (February 18, 2013) screening of "Designing Healthy Communities" at 6pm at the Wilma Sherrill Center on the campus of the University of North Carolina at Asheville. For those that can't make it, mark your calendar for March 25, 2013 when two additional episodes will be screened (also at 6pm at the Wilma Sherrill Center on the campus of the University of North Carolina at Asheville). Dr. Jackson first connects the dots of bad community design with burgeoning health costs, then analyzes and illustrates what ordinary citizens, including many young people, are trying to do about this urgent crisis, now on the front pages of many newspapers, by looking “upstream” for innovative solutions. Designing Healthy Communities looks at many places where we live, work, study and play and suggests they look the way they do because we have not assessed in advance the public health consequences of policy decisions. Dr. Jackson‟s conclusion: For the first time in our nation‟s history, we are subtracting years of life from our children because of the chronic diseases of obesity, asthma, and diabetes. Dr. Jackson presents best practice design alternatives that can sharpen policy makers thinking in how they look at their communities today. Designing Healthy Communities identifies several common characteristics of unhealthy communities that can be changed, including: reliance on fossil fuel to navigate; limited walking space if no sidewalks at all; lack of access to green parks, trails, and gardens; production of pollution and particulate matter; expanding environmental injustice for millions of residents who cannot afford to move; increase of life-threatening interconnected chronic diseases like asthma, obesity, diabetes, and heart disease, particularly among our youngest members of society; lack of socialization; place making and adopting a sense of community. Essential elements of our well-being are out of balance. While public health expenditures skyrocket, our physical, psychological, and spiritual health deteriorates, and we as a nation wonder why healthcare reform is so essential.